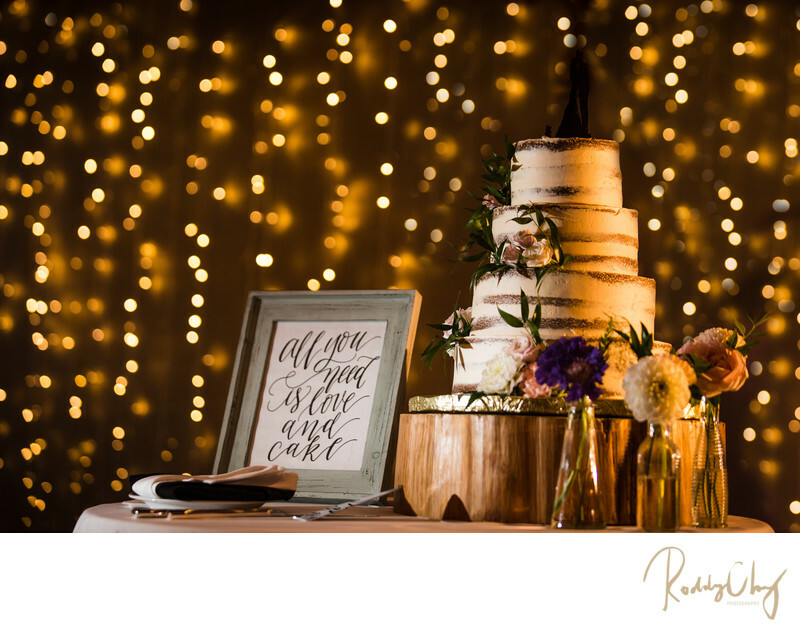 Thanks to DJ Troy's lighting decoration in the backdrop hanging on the wall that creates beautiful bokeh throughout, I was able to create a stunning detailed photograph for the wedding cake. Then I placed two speedlites on both sides. One with bare flash and another one with CTO gel on to the right side to match the Christmas lighting in the background. The same effect can also be seen from this photograph of the bride and her bridesmaid of the same wedding. This is by far the best wedding cake photograph I've ever created. And not only does the cake look good, it is also certainly one of the most delicious cake I have ever tasted. Last but not least, the cute sign "all you need is love and cake" definitely sums up the reason why we need to have delicious cake at a wedding. Willows Lodge is located in Woodinville, WA which is 20 minutes away from Seattle. It's in the suburban area that is perfect for any couple who want to have an elegant reception venue that's not too far away from the city. It has a walking garden in the back which provides a lot of great spots for wedding portraits. Location: 14580 NE 145th St, Woodinville, WA 98072.